This fascinating picture was taken at the Office Depot in Westlake (Austin, Texas). 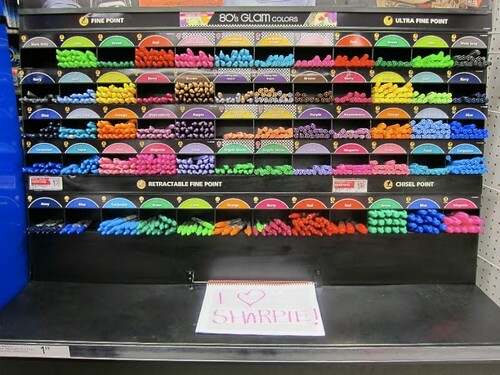 I have never before seen such a Sharpie display. I was a little disturbed by the colors in the wrong color slots (why do people not return them to their proper home??) and the occasional Sharpie that was facing the wrong direction (whyyyyyyyy!!!!!!!!) and some lid colors that didn't 100% match the other lid colors in its lot... Barring all that, this is a fun and colorful display! I tried out a few colors but I have sooo many in different nib sizes and colors that I couldn't justify it to myself. I'm sure I'll break down and go back. I tried not to look like an obviously crazy person taking this picture but I had to take a few to get them all in. The aisles were small so I had to stand as far back as possible, then lean back with the camera to capture it all. Needless to say, I hurt myself doing so. I'm not sure how I function. The employees probably thought I was a nutter. Guilty as charged. Nutter, definitely nutter. You don't need an employee to tell you that! You are obviously jealous of my love for the glamorous display. "...was a little disturbed by the colors in the wrong color slots (why do people not return them to their proper home??) and the occasional Sharpie that was facing the wrong direction (whyyyyyyyy!!!!!!!!) and some lid colors that didn't 100% match the other lid colors in its lot... "
Quite so. Respect display niceties or feel my wrath. If I catch you that is, and my wrath [because I'm British] basically = hard stare and extensive tutting. "Needless to say, I hurt myself doing so. I'm not sure how I function." LOL! Hey, at least I'm not the only nutter/dysfunctional person who also appreciates all colors to be matching and in their own home! Filofax Giveaway by Kyla Roma!